The accuracy of a machine learning system depends on the complexity of the model that it uses to make predictions, as well as the number of data instances available for training this model. 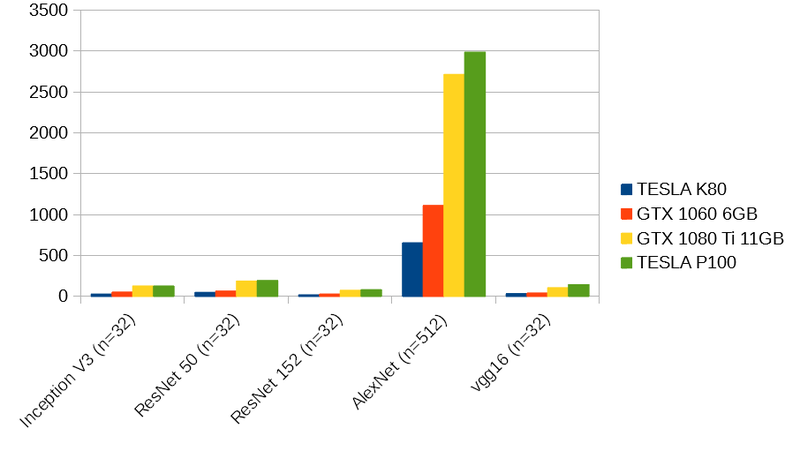 The experiments described in this post are designed to evaluate the performance of three ResNet image classification models, each with a different number of layers. These models were trained using 50,000 images from the CIFAR-10 dataset, but were also trained separately using smaller subsets of the CIFAR-10 dataset. The CIFAR-10 dataset consists of 60,000 low-resolution images. These images are so small (32 pixels on each side) that even a highly complex model can be trained on a single GPU in a matter of hours. 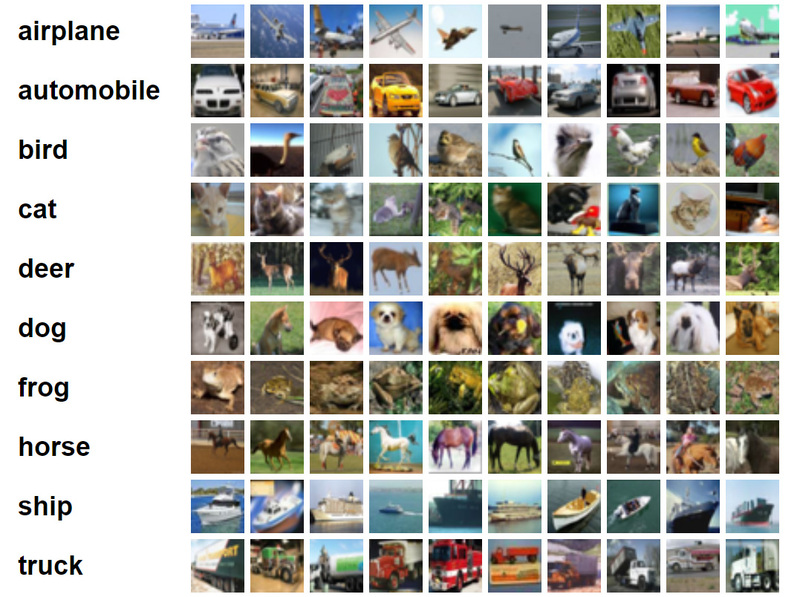 Each image in the CIFAR-10 dataset is labeled as a member of one of 10 mutually exclusive classes. The images are split up into a training set (50,000 images) and a test set (10,000 images). This program permits training on a subset of the full CIFAR-10 training set. 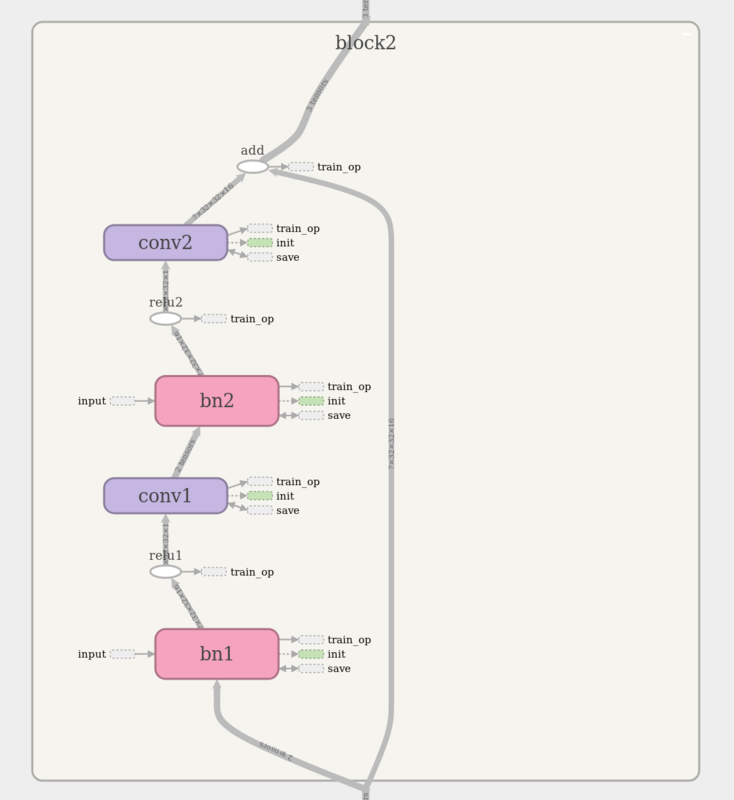 The ResNet architecture can be visualized interactively using TensorBoard. The TensorBoard image below shows a ResNet block with two layers. As an example, ResNet-56 consists of 27 similar blocks stacked one atop the other, plus a few more layers at the top and bottom of the stack. The references at the end of this post provide detailed information about CNNs and ResNets. 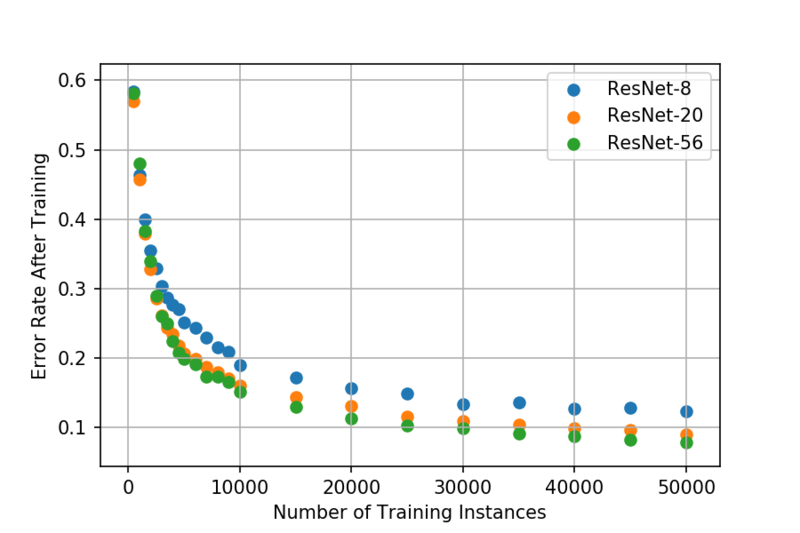 Here are the results that were obtained after training three different ResNets on subsets of the CIFAR-10 training set. Each data point represents the test set error rate that was achieved after training the model on a certain number of images. For example, the models on the very left hand side of the graph were trained on just 500 images, and the ones on the right hand side were trained on all 50,000. Although it is well known that increasing the amount of training data increases the performance of a model, it is interesting that the relationship plotted above follows such a well-defined exponential decay pattern. The error rate appears to approach an asymptotic limit as the amount of training data is increased. It looks like it would be possible to fit an exponential decay function to the points plotted above. This exponential function could then be used to extrapolate and predict the performance that a model would achieve if more training data were available. This three-stage vacuum pumping system creates a very strong vacuum, in which charged particles can travel long distances without colliding. It has a large stainless steel vacuum chamber with a transparent cover. 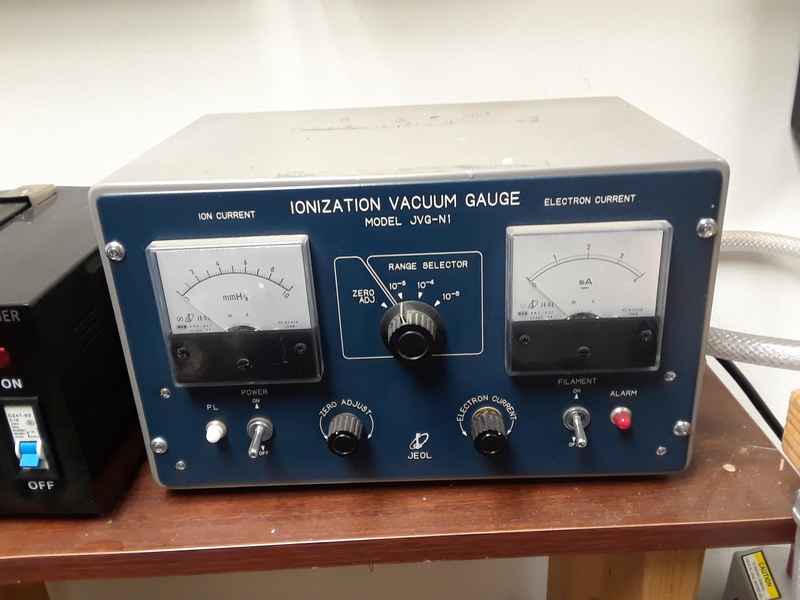 When paired with a high voltage power supply, it can be used for experiments involving electron beams, ion beams, etc. There is always a chance that a home-made vacuum chamber may implode. If left un-attended, the diffusion pump heater will create a fire hazard. High voltage vacuum experiments have the potential to generate harmful X-Rays. The two-stage rotary vane pump is a mechanical pump that brings the system pressure down to about 30 microns Hg. It was purchased brand-new from Harbor Freight Tools. Originally, I tried to use an r134a refrigerant charging hose to connect the rotary vane pump to the oil diffusion pump. Unfortunately, the inside diameter of this hose was only about 3/16″ and this created an unacceptably large pressure differential between the diffusion pump exhaust and the rotary vane pump inlet. To solve this problem, I un-screwed the flared fitting that came with the rotary vane pump and connected the pump to a 1/2″ fiber-reinforced flexible plastic tube. A cork-shaped silicone plug was used to join the other end of the tube to the diffusion pump. Nylon barbed tube fittings were used on both ends of the tube. 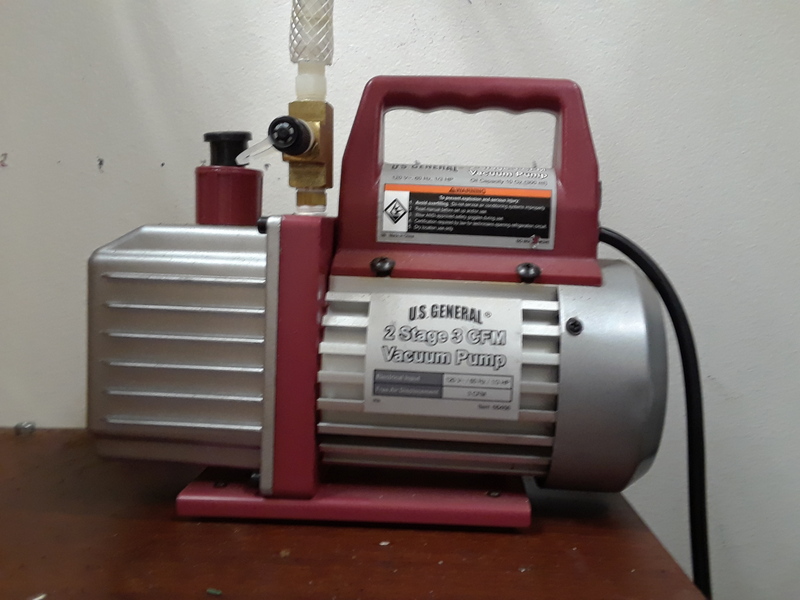 I purchased a used 4″ vapor diffusion pump from eBay. It appears to have been salvaged from a JEOL scanning electron microscope, and was in very dirty condition when I received it. This pump was the victim of a careless operator. It is very important to make sure that the rotary vane pump is turned on before the diffusion pump heater, because otherwise the oil will burn and create a huge mess. I dis-assembled the pump and was able to clean out most of the burned oil by scrubbing it with soap water and a wire brush. I purchased a bottle of replacement oil directly from Kurt J Lesker Company. The radiator was salvaged from an old Power Mac G5 computer, and the water pump was purchased from eBay. Rubber tubing was used to make all the connections. Two computer fans are used to force air through the radiator. Unfortunately, this system is not large enough to handle the 500W heat output. The radiator becomes too hot to touch after about 20 minutes. A radiator from a small car would probably be more appropriate. Proper cooling will improve the overall performance of the pump by causing the oil vapor to condense as soon as it hits the walls of the pump. The system functions just fine without a vapor baffle, but I was lucky enough to find a matching baffle for my diffusion pump on eBay. It helps to prevent oil vapor from escaping into the vacuum chamber. When the diffusion pump is starting up, it may spew hot oil vapor into the vacuum chamber unless the gate valve is closed. I purchased a used 2″ gate valve from eBay for about $30. I had to replace all of the O-Rings, and I also noticed that vacuum grease had been used on the valve. I purchased a tube of Dow Corning vacuum grease from eBay, and started using it on all of the rubber O-rings and gaskets. A 3/8″ aluminum plate is used to connect the diffusion pump inlet to the gate valve. Nitrile rubber O-rings are used to seal both connections. The vacuum chamber is built around a large Bain Marie pot that I purchased from Food Service Warehouse. 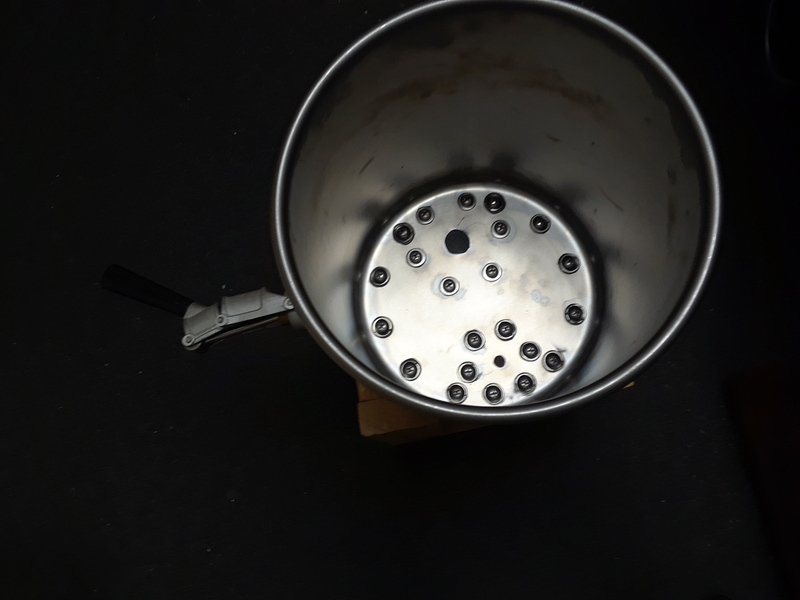 It is constructed from heavy-gauge sheet metal, and does not have any handles that could potentially leak air into the chamber. Although the cylindrical portion of the pot seems to be structurally sound, I suspect that the flat base could crumple under full vacuum. Therefore, I created a 1/2″ polycarbonate reinforcement plate to take all pressure off the stainless steel base. 14 bolts are evenly spaced around the perimeter of the base, and a 1/16″ nitrile rubber gasket seals the stainless steel chamber to the polycarbonate plate. Some of the bolt holes are sealed with JB-Weld, a slow-setting epoxy resin. After mixing the epoxy, I de-gassed it for about a minute in an ordinary vacuum chamber. The remaining bolt holes are sealed with special screws (from McMaster) that come with built-in O-ring seals. During operation, the vacuum chamber is covered with a 1/2″ polycarbonate plate. 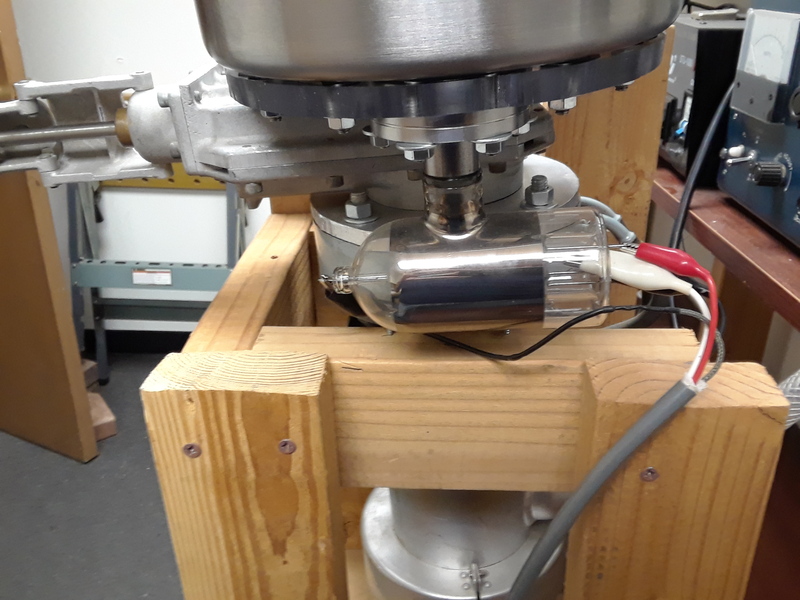 This allows the inside of the vacuum chamber to be viewed, and also makes it easy to change between different experiments (by using a different chamber cover for each experiment). The cover seals against the rounded stainless steel edge with a 1/16″ nitrile rubber gasket sheet. I purchased a variable leak valve on eBay. This is an unusual item, and I had to wait a while for one of them to come on the market. A variable leak valve can be used to introduce very small amounts of gas into the vacuum chamber. This is necessary for certain experiments, such as the fusor. JB Weld was used to attach the leak valve to a 1/4″ NPT fitting, which was then screwed into a hole that was tapped in the polycarbonate cover. PTFE paste was used to seal the NPT fitting. 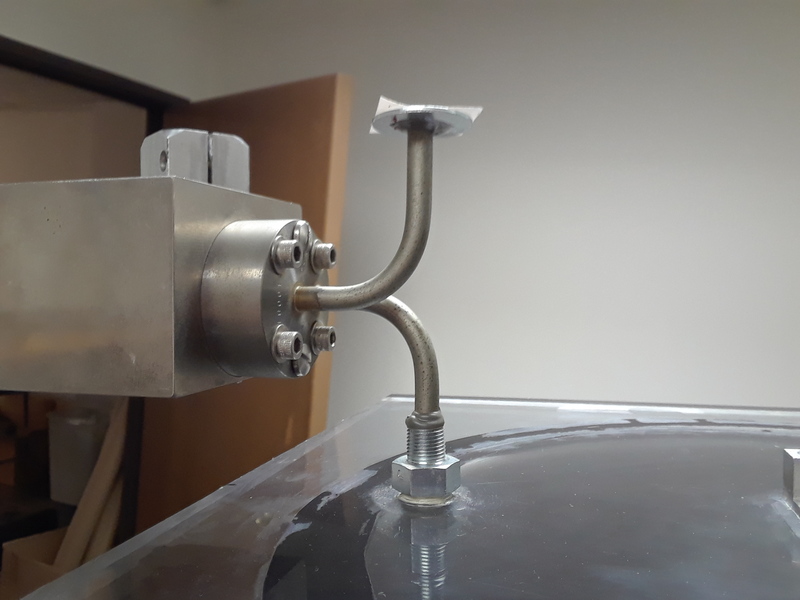 A convection gauge is fitted to the top of the vacuum chamber cover. The convection gauge has a special fitting that seals against a nickel gasket. I was able to find an adapter that converts the special vacuum fitting on the gauge to a regular NPT fitting, as well as a pack of nickel gaskets. Thanks again, eBay! I drilled and tapped an NPT threaded hole into the chamber cover and sealed the connection with PTFE paste. The Granville Phillips mini convectron gauge actually has most of the electronics built-in. It just needs to be connected to a power supply and the output voltage can be read by an Arduino or even a multimeter. The ionization gauge is bolted to the bottom of the vacuum chamber base plate, and sealed with an O-ring. It was actually designed to be sealed with a metal gasket, but the O-ring works just fine because it fits inside the larger-diameter circular blade that was originally intended to form a seal. The gauge is connected to electronic instrumentation that I purchased on eBay. It looks like this item was also salvaged from a JEOL electron microscope. This page describes my most recent desktop PC build, which is designed specifically for training convolutional neural nets on a single GPU with TensorFlow. Effective cooling is very important when running a device with 250W TDP. I selected the MSI GTX 1080 Ti Gaming X card because it has good reviews regarding cooling. Unfortunately, although the card does an excellent job of keeping itself cool, it does so by heating up the motherboard and other components! Some cards have a different type of cooler that blows hot air out the back of the case through the PCIe slots. It may be best to go with this type of design instead to ensure that the system as a whole runs cool. The only drawback is that these “squirrel cage” blower fans tend to be somewhat louder than open air fans. Intel’s new i5-8400 6-core CPU provides a good balance of cost and performance. Although TensorFlow tries to use the GPU as much as possible, it still relies on the CPU for certain operations that lack GPU implementations. When running TensorFlow benchmarks, the CPU utilization is only around 20% to 30%. However, more typical code is not going to be this efficient. Even if the code is well-written, there are often trade-offs between performance optimization and readability. During training of one particular model using lightly optimized code, the performance monitor indicated 100% CPU utilization. This seems to suggest that an even faster CPU would be helpful when experimenting with code that has not been fully optimized for performance. Unfortunately, Intel CPUs with more than 6 cores are not only expensive, but also require expensive LGA2066 motherboards. AMD Ryzen CPUs may be worth looking into. One possible issue is that I am using a pre-compiled version of TensorFlow-GPU that does not utilize AVX and AVX2 extensions. By building TensorFlow-GPU from source and enabling these 256-bit vector instructions, it may be possible to speed up CPU performance by up to a factor of two. I have yet to try this. The Intel i5-8400 is only compatible with the new Z370 motherboards. 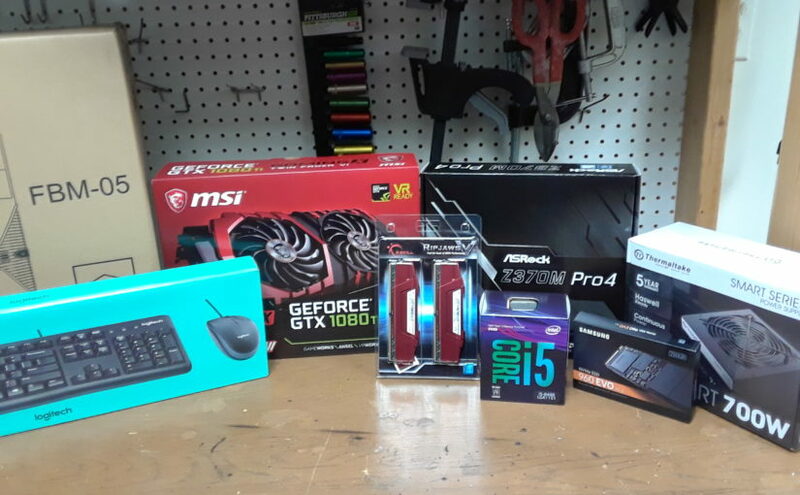 It is very important to check that the motherboard is compatible with all components that are being purchased. I have had good results with the ASRock Z370M PRO4 motherboard. This motherboard also has extra memory slots and an extra M.2 slot for future expandability. 16GB is a good amount of memory to start out with. To get good memory bandwidth, it is necessary to split up into two 8GB sticks since the CPU has dual memory channels. The i5-8400 CPU is designed for use with DDR4-2666 memory. I was very excited to try out the new Samsung 960 EVO M.2 SSD. This SSD is mounted directly onto the motherboard, so there are no cables and mounting brackets involved. More importantly, the M.2 slot is connected to the Z370 chip with 4 PCIe 3.0 lanes. This high bandwidth connection enables sequential read and write speeds of 3200MB/sec and 1500MB/sec respectively. This is much faster than a SATA 3.0 SSD, which is limited by the interface to 600MB/sec. Money does not buy happiness when it comes to computer cases. Expensive “gaming” cases are built with heavy-gauge sheet metal and are therefore very heavy. It is better to find a lightweight microATX case that can be moved around easily. The most important thing is to make sure that there is enough room for a full-length graphics card. The 2-fan MSI card that I used is about 10.5″ long. 3-fan models can easily reach 12.5″ and may not fit in the Rosewill FBM-05 case that I selected. Good airflow is essential if you are using a GTX 1080 Ti with open-air fans. The FBM-05 case comes with front and rear fans, and the power supply also helps to remove hot air. If you are using a GPU with a squirrel-cage blower, case ventilation becomes much less important. The GTX 1080 Ti is recommended for use with a power supply rated for at least 600W. The power supply also needs to have at least two 8-pin GPU power connectors. I thought about building a computer with multiple GPUs, but this idea is not as good as it sounds. The GPU is connected directly to the CPU using 16 PCIe lanes. Mainstream CPUs such as the i5-8400 have enough lanes for only one GPU. If you use two GPUs, a special motherboard will be needed and each GPU will have access to only 8 PCIe lanes instead of 16. Transfers between the CPU and each GPU will therefore take up to twice as long. This could potentially create a bottleneck, and the CPU itself may also prove to be a weak link when using two GPUs. The much more expensive Intel i9-7900X has 10 cores and 44 PCIe lanes, so it can definitely handle two GPUs. This may be a good solution for training a single model on two GPUs in parallel. However, if the idea is to train two experimental nets at the same time to see which one works better, it is more cost-effective to build two computers like the one on this page with one GPU each. The motherboard comes with an instruction manual that has most of the information needed for assembly. I started out by installing the CPU, memory, and SSD on the motherboard, and the power supply in the case. Then I attached the motherboard to the case and made all the connections. Installing the GPU is the final step. CPU fans are always a little tricky. The instructions that come with the CPU should be followed very carefully. The computer case should be grounded during assembly. One way to ground the case is to plug it into a surge protector that is switched off. An electrostatic wrist strap is also recommended. Static discharge can easily destroy a CPU or memory chip. It is also important to avoid touching the CPU contacts, which are very delicate. Finally, remember that sheet metal edges are very sharp! TESLA K80 – Benchmark results from tensorflow.org, tested on Google Compute Engine with a single GPU. Amazon EC2 also uses TESLA K80 GPUs, so this is similar to what you would get with an Amazon EC2 P2.xlarge instance for about $0.90 per hour. GTX 1060 6GB – Benchmark results from my old PC, with an AMD FX-8320e CPU. Tested on pre-built TensorFlow 1.4 for Windows. Due to limited GPU memory, batch_size 24 was used for resnet152. GTX 1080 Ti 11GB – Benchmark results from the PC described on this page. Tested on pre-built TensorFlow 1.4 for Windows. TESLA P100 – Benchmark results from tensorflow.org, tested on the Nvidia DGX-1 with a single GPU. The TESLA P100 is currently the top-of-the-line datacenter solution, soon to be replaced with TESLA V100. For comparison only. The DGX-1 with 8 P100 GPUs is priced at $129,000, so you would never actually use it with a single GPU. Update UEFI to the latest version (otherwise, Ubuntu may not load properly). Here is a video I found that shows how to install TensorFlow GPU and its dependencies: https://www.youtube.com/watch?v=rILtTjrecQc. This video is just slightly out of date. I installed TensorFlow 1.4, CuDNN 6.0, and the latest version of Anaconda. It is important to install versions of CUDA and CuDNN that are compatible with TensorFlow – not necessarily the latest versions. 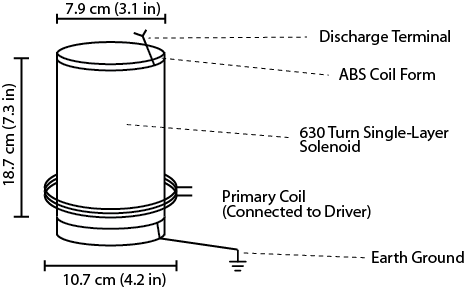 The system described in this post is a continuous wave solid state Tesla coil (CW SSTC). As seen in the video above, it produces sparks that look very different from those of a traditional Tesla coil. The continuous wave output gives rise to thicker, brighter, shorter sparks that appear almost sword-like. The circuit diagram is depicted below. A standard function generator is configured to produce a square wave. The frequency of this square wave must be adjusted to match the resonant frequency of the coil (approximately 600 kHz). 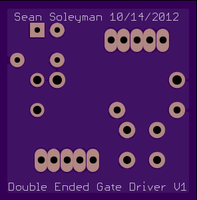 Next, the gate drive board amplifies this signal to the appropriate level for driving power MOSFETS. A gate drive transformer isolates this low voltage gate drive board from the H bridge, which runs at 160 volts. The H bridge converts direct current to high frequency alternating current, which drives the air core coil at its resonant frequency. Digital Multimeter – A digital multimeter is required for checking supply voltages and identifying damaged components. With care, it can also be used to measure power consumption and analyze circuit performance. LRC Meter – A precision LRC meter can measure the leakage inductance and magnetizing inductance of the gate drive transformer. 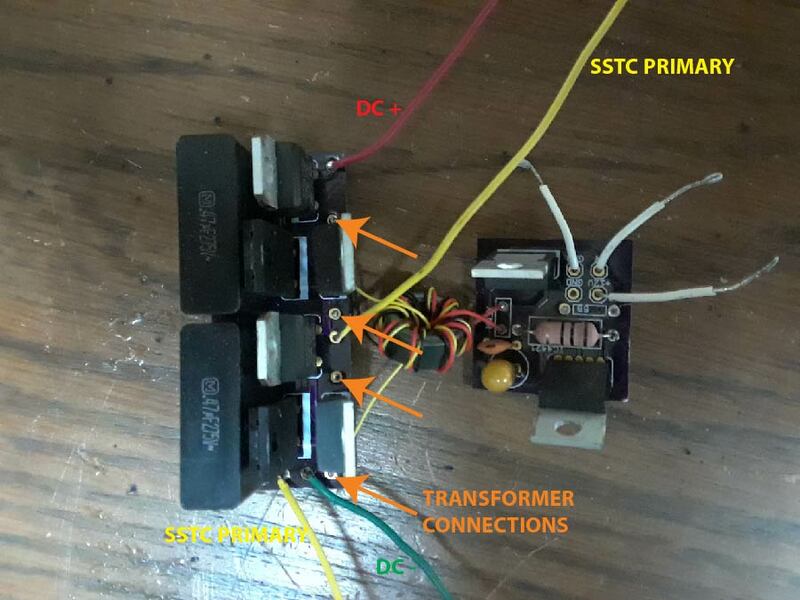 It can also be used to characterize the air core transformer. The Vichy DM4070 (available on eBay) has the 1uH accuracy needed for this application. It is possible, but inconvenient, to measure inductance without an LRC meter. Soldering Iron – A soldering iron is used to assemble the PC boards, and to make a few other connections. Oscilloscope – If the circuits described here are constructed exactly as described, they should work correctly. In practice, however, minor construction variations can change the behavior of the circuits significantly. An oscilloscope can be used to check for correct operation, and is essential for any experimenter who wishes to design RF circuits from scratch. Function Generator – An HP 3311A function generator is used to provide the signal for this SSTC. Any function generator can be used as long as it can produce a square wave with a range of 0V to 10V. The frequency must be adjustable from 100kHz to 1MHz. 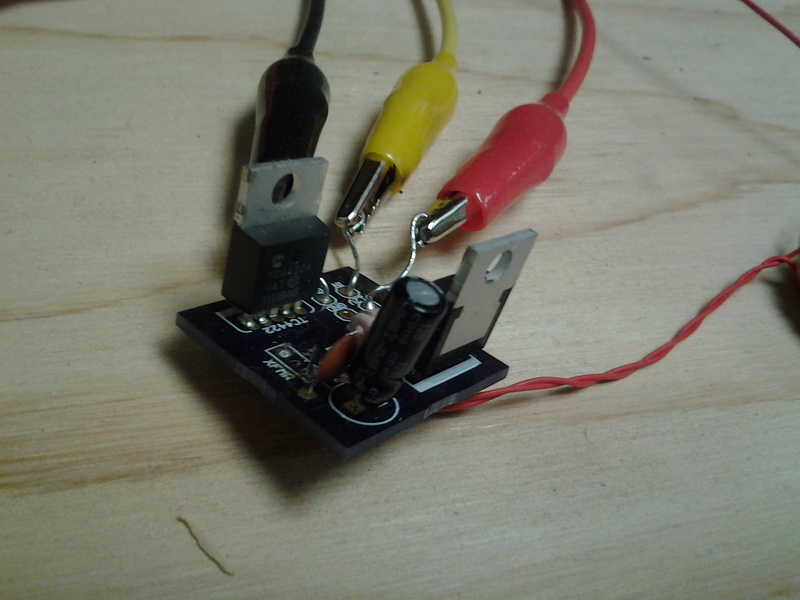 If you can not find one, you can build a simple square wave generator instead. DC Lab Grade Power Supply – Good lab grade power supplies are available on eBay. A 12VDC regulated plug-in power supply can also be used. The signal from a function generator is not strong enough to drive power transistors. The high performance gate drive circuit described below will amplify the signal to levels that enable high speed switching. The PC board can be manufactured by a company such as Osh Park. Upload the following files to their website, and they will process your order. The TC4421 and TC4422 ICs are designed for use as a MOSFET gate drive. Together, they form a small H bridge inverter that converts 12VDC to high frequency AC. The 50 Ohm input resistor should only be used in conjunction with a function generator that is calibrated for a 50 Ohm load. This resistor must be omitted if you are using a regular function generator, a 555 timer, or a 4046 VCO. The 100nF and 10uF capacitors provide power supply stability, and they should not be omitted. The MOSFETS draw very large currents while turning on and off, and the capacitors can provide this current instantaneously. The purpose of Rg is to improve the quality of the gate drive waveform. If it is omitted, the parasitic inductance of the circuit can cause ringing in the waveforms. 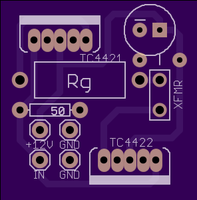 A 5 Ohm resistor can be used for Rg, but experimentation will be needed if an optimal value is desired. X1 is the gate drive transformer. It will be described later. Attach wires to all of the inputs on the circuit board. These wires will connect the board to a 12 V power supply, and to a function generator. The Half H Bridge is a high power inverter circuit. It converts DC to high frequency AC, which is used to drive the Tesla coil. The small components drawn on the board are optional Transient Voltage Suppressors – pairs of back-to-back zener diodes that protect the MOSFET gates from any voltage exceeding a certain threshold. If measures are taken to prevent the waveform from ringing above the gate’s maximum safe voltage, these components can be omitted. The Tesla coil itelf consists of two coils: one with just a few turns, and one with several hundred turns. For this project, I re-used the transformer from a low-power solid state Tesla coil kit sold by Eastern Voltage Research. The parts are, however, readily available. The secondary coil can be wound on any cylindrical form of proper diameter. I used a small lathe to wind mine. A 630 turn coil can also be wound by hand. A thin layer of polyurethane can be applied to secure the windings to the coil. The primary coil should be separated from the secondary. A slightly larger plastic pipe should be used as the coil form. Only 3 turns are needed. The top of the secondary should be soldered to a short, thick wire. If the thin copper wire emits a spark, it will melt quickly. The bottom of the secondary coil should be connected to earth ground. It can be wired to the ground prong of a power outlet, or to a cold water pipe. The primary coil connects to the half H bridge as shown in the first diagram. The gate drive transformer isolates the gate drive board from the H bridge board. Wire wrap wire is recommended for this transformer. It consists of a thin silver-plated wire with very tough insulation. If copper magnet wire is used instead, make sure to wrap the core in electrical tape so that it does not scratch away the insulation. Twist 3 2-foot long strands of wire wrap wire together. Wrap 10 turns of twisted wire on the ferrite core, and strip away the insulation at the ends. Connect together the components as shown in the schematic diagram found at the beginning of this post. 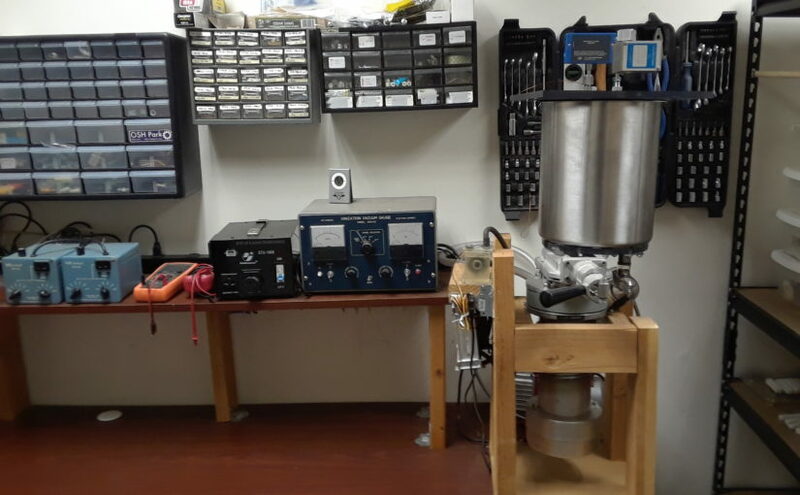 Although the SSTC can be connected directly to the power line, it is better to use an isolation transformer for testing purposes. Otherwise, it may not be possible to use an oscilloscope to test the circuit. I used an antique VIZ Isotap II transformer, which includes a built-in fuse. The AC current from this transformer must be rectified before it is fed to the half H bridge. A 10 amp (approximate) rectifier diode or full wave rectifier bridge can be used for this purpose. Configure the function generator to produce a 600kHz square wave, swinging from 0V to 10V. Use an oscilloscope to verify that the gate drive board is receiving a proper square wave. Apply 12VDC to the gate drive board, and make sure that the output is swinging with 12V amplitude (24V peak to peak across the primary coil of the gate drive transformer). If possible, use an adjustable isolation transformer to power the half H bridge board, starting with a low voltage and working your way up to 160VDC. 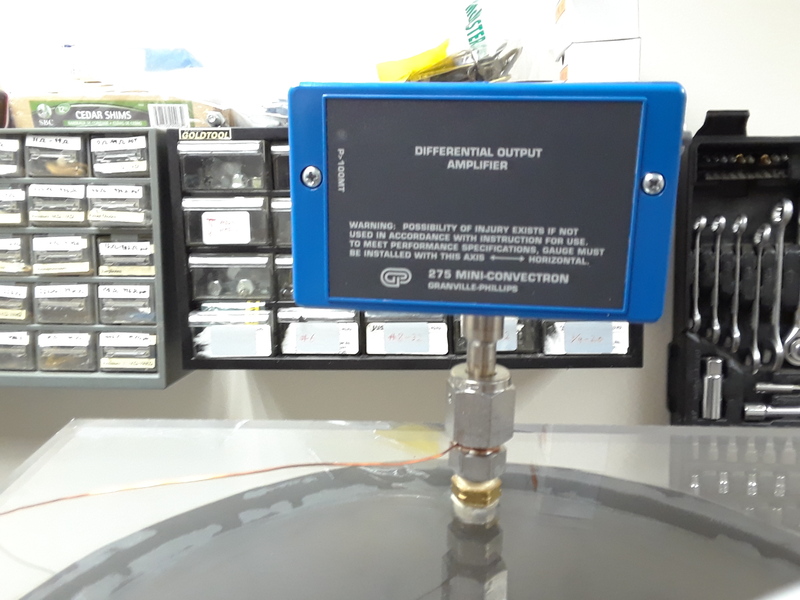 WARNING: If you are not using an isolation transformer, you can not connect your oscilloscope probe to the secondary side of the gate drive transformer. The oscilloscope probe is grounded. Adjust the frequency of the function generator by sweeping from around 400kHz to 700kHz. When you hit the resonant frequency, there should be sparks. Steve Ward’s Website – Steve Ward does a lot of work with DRSSTCs, which produce longer sparks than the traditional SSTC described here. As far as I know, his site is home to the largest, most powerful SSTCs. Richie Burnett’s Website – Richie built a similar SSTC to the one described here, but he did so about 15 years ago. His site is still the best source for information on SSTC operating principles and theory. It also contains information on spark gap Tesla coils, Class E SSTCs, and induction heating. Jan Wagner’s Website – Jan has published many useful circuits and design notes. Eastern Voltage Research – Dan McCauley has written a book on DRSSTCs, and also sells SSTC kits. I purchased some of his products, and found them very interesting. NOTE: This post was originally published January 2015 (old website). Back in 2007, I used to fabricate my own printed circuit boards using the toner transfer / ferric chloride etching process. This produced excellent copper trace quality, but drilling holes for all the component leads was a challenge. 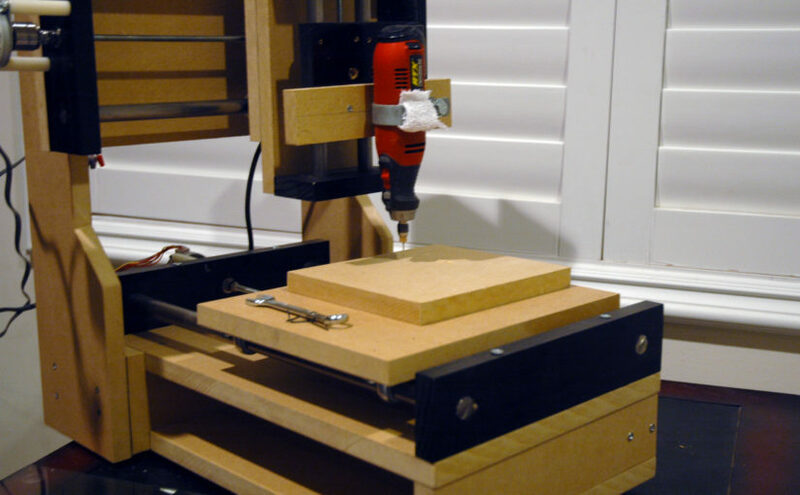 I decided to build a CNC machine to automate this task. A program running on a computer reads instructions from a drill file generated by CAD software, and uses the serial port to send motion coordinates to an ATMega16 microcontroller. 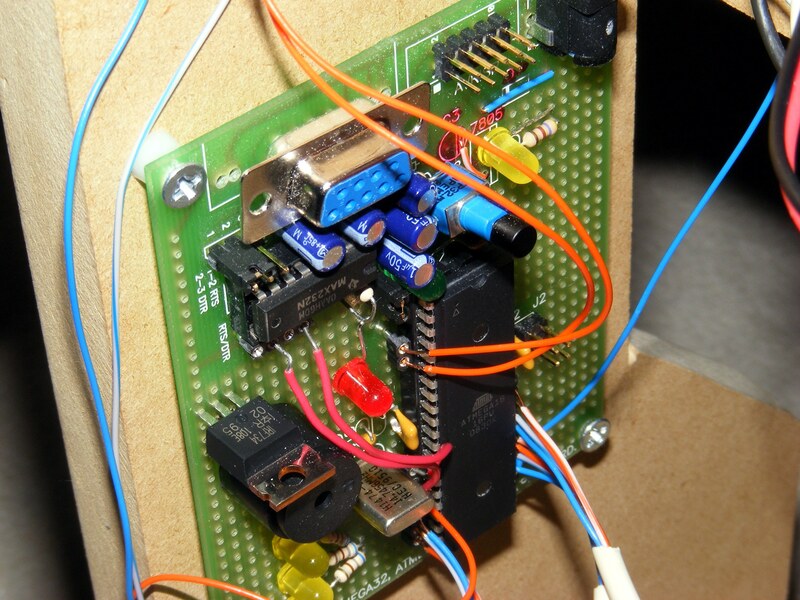 This microcontroller handles all of the stepper motor timing and input/output functions. A separate driver board boosts the microcontroller’s logic-level signals to activate the motor and relay coils. Each of the three stepper motors controls a linear slide that offers one degree of freedom between the workpiece and rotary tool. A relay controls the rotary tool itself. This is a 3-axis CNC machine. Each axis consists of a stepper motor, a lead screw, and a platform mounted on a linear slide. 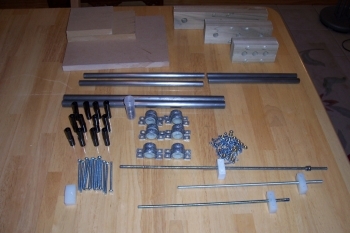 I purchased the mechanical components as a customized kit from Modular CNC (shown above). The wooden frame was constructed from a sheet of readily-available MDF (fiberboard). With careful planning, I was able to cut all of the frame components from a 3/4″ x 24″ x 48″ panel. Once the frame was complete, I attached the three linear slides to it with wood screws. 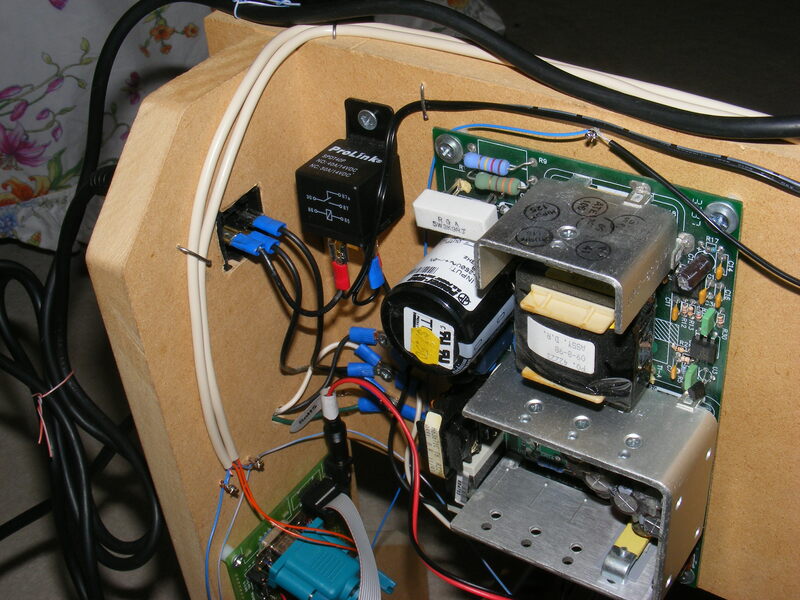 The drive board uses power transistors to switch the stepper motor windings on and off. 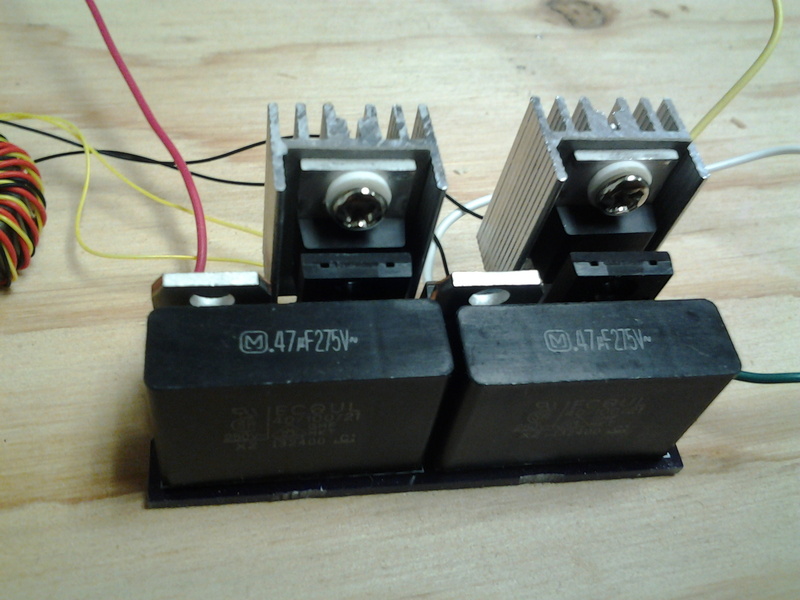 I used unipolar stepper motors, which are easily controlled by a single transistor for each winding. The control board consists of an AVR microcontroller and associated hardware. It receives instructions from a PC, and generates control signals for the drive board. 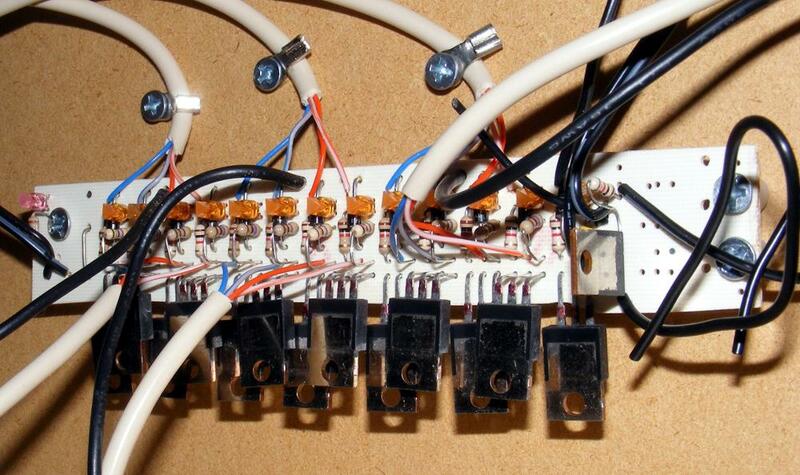 The control board that I used for this project is the AVR-P40-8515, purchased from eBay. 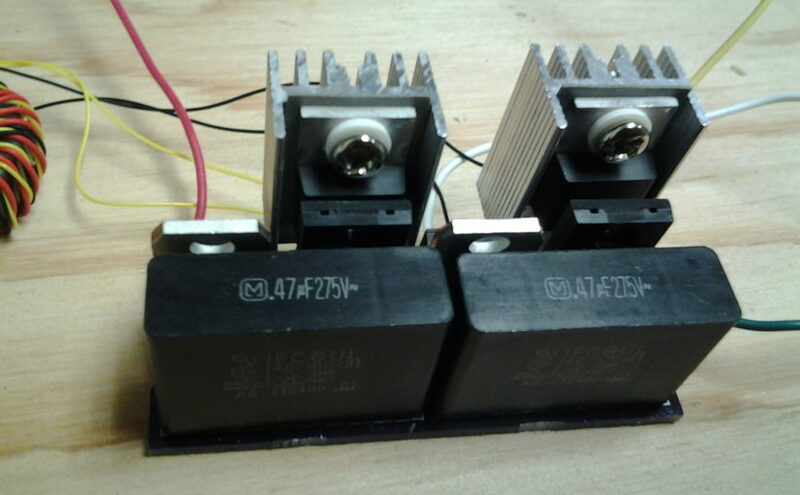 The power supply shown above provides 5 VDC for the control electronics, and 12 – 24 VDC for the stepper motors. Also shown is a relay, used to control the rotary tool. The rotary tool was mounted to the Z-axis platform using a fence post bracket, and connected to the relay using a power outlet. My project is partially based on Jonathan Westhues’ similar machine.